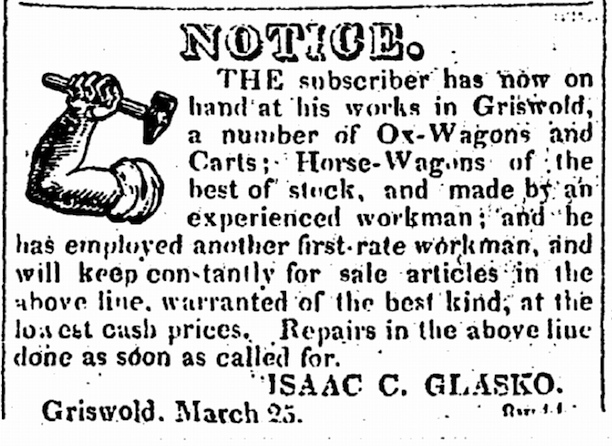 "Notice," an advertisement by Isaac C. Glasko in the Canal of Intelligence newspaper, Norwich, May 13, 1829. Isaac Glasko was born in Rhode Island in 1776. Descriptions of his parents, Jacob and Martha Glasko, remain incomplete but both apparently were of mixed African American and Native American heritage. Some accounts indicate they may have been slaves in colonial Rhode Island who bought their way out of slavery by the time of Isaac’s birth. In a society accustomed to clear delineations among the races, locals referred to the Glaskos as black. When Isaac was still a boy, the Glasko family moved to North Uxbridge, Massachusetts. Isaac later went to work as a blacksmith and married a local woman, Lucy Brayton. 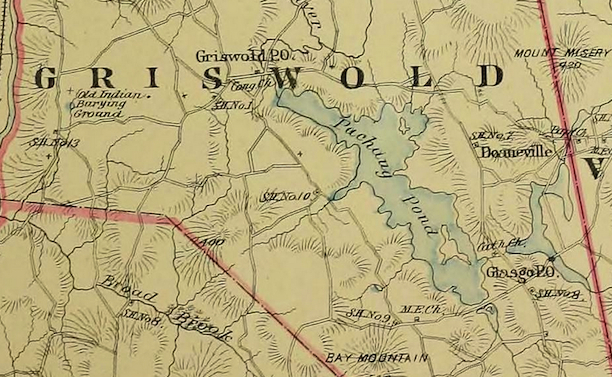 In 1806 Isaac, his father, and his brother George bought land in Griswold in southeastern Connecticut. Located near the Pachaug River, Griswold is close by the border with Rhode Island. The plot of land that Isaac purchased from local resident Alexander Stewart included a house where he and Lucy lived for the rest of their lives. In what proved to be a very wise move, as part of the purchase Isaac also received access rights to water power from the Pachaug where a dam served a mill Stewart owned. While his brother George went into the shoemaking business with William Kinne (a relative of Stewart’s), Isaac set up a forge on his property and established a blacksmithing business. In his early years in Griswold, Isaac’s customers were mostly local farmers for whom he produced spades, axes, hoes, and other tools. He and Lucy had several children including Isaac Jr. (who became a blacksmith and worked for many years with his father) and a daughter Eliza (who attended the school in Canterbury established by Prudence Crandall that is thought to be the first integrated school in the United States). Once firmly established, Glasko expanded his business by selling to people employed in the whaling industry around New London. He manufactured lances, mincing knives, harpoons, and other metal tools used by whalers, and his reputation as an expert blacksmith grew. He also did a brisk business with shipbuilders for whom he produced chains, anchors, and other metal accoutrements. During this period, Glasko had up to ten people working for him in his forge. Detail of an advertisement offering “For Sale” the business establishment of Isaac C. Glasko, Griswold, Connecticut. Printed in the Norwich Courier, March 26, 1828, page 4. The water access rights Glasko acquired along the Pachaug proved important to the success of his business, as he made and used a giant trip hammer in his forge using water directed from the Pachaug River to a water wheel in his shop. This arrangement enabled Glasko to make large tools he might not have been able to manufacture otherwise, and it allowed him to do many jobs more quickly and with less physical exertion. “Notice” placed by Isaac C. Glasko in New London’s People’s Advocate, March 13, 1844. For reasons not entirely known, Glasko’s blacksmithing business eventually went into decline and he ended up declaring bankruptcy. 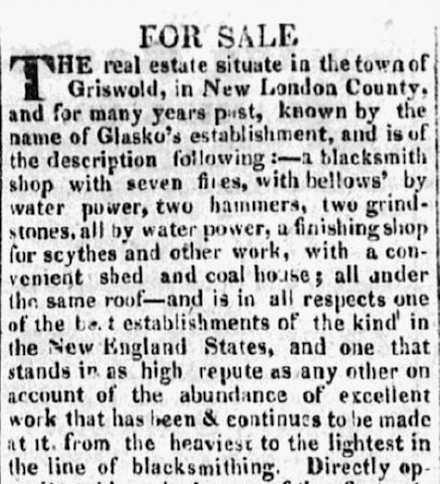 He continued working his trade, however, and remained a well-respected resident of Griswold, so much so that the section of the town where he, his father, and brother lived became known as Glasko. Because of a bureaucratic error made when a post office opened in the hamlet some years after his death, however, the spelling of the name of the area became Glasgo. The misspelling notwithstanding, there is no question that the word traces back directly to Isaac’s name. Glasko died in 1861 and received a burial in the Kinne Burying Ground alongside his wife Lucy, who died in 1849. Both before and after his death, however, his efforts resonated with Americans of all colors and his house and the grave where he remains buried became popular historical landmarks. Bridgeport native Andy Piascik is an award-winning author who has written for many publications and websites over the last four decades. He is also the author of two books. “Glasgo Village.” Connecticut Freedom Trail, 2016. Link. “The Indian & Colonial Research Center,” 2016. Link. “New London County Court African Americans and People of Color Collection - Inventory of Records.” Connecticut State Library, 2016. Link. Normen, Elizabeth J., ed. African American Connecticut Explored. Middletown, CT: Wesleyan University Press, 2013. Knoblock, Glenn A. African American Historic Burial Grounds and Gravesites of New England. Jefferson, NC: McFarland & Company, Inc., 2015. Calloway, Colin G. After King Philip’s War: Presence and Persistence in Indian New England. Hanover, NH: University Press of New England, 1997. Adams, George. The Connecticut Business Directory, Giving the Names and Post Office Addresses of Merchants, Manufacturers, and Professional Men... Boston, MA: Briggs & Co., 1856. Link. Connecticut State Agricultural Society. Transactions of the Conn. State Agricultural Society, for the Year 1854. Vol. 23. Hartford, CT: State of Connecticut, 1855. Link. Kimball, Carol W. “Blacksmith Isaac Glasko Left His Mark on the Region.” The Day. September 22, 1999. Link.